MOSCOW. 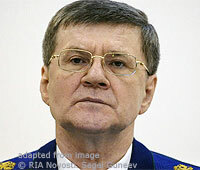 June 7 (Interfax) – Russian Prosecutor General Yury Chaika has suggested giving the Justice Ministry the right to conduct extraordinary inspections of NGOs. “We suggest giving the Justice Ministry the right to conduct extraordinary inspections of NGOs if there is information that they are in breach of any bans and restrictions envisaged by the law,” Chaika told a parliamentary hearing in the Federation Council. “The events of the past few years convince one that legislative changes on strengthening control over NGOs is absolutely right,” Chaika said. “Our practice indicates the need for further improvement of the legislation [on NGOs],” Chaika said. One should also ensure the possibility of implementation of programs and foreign financing of the NGO sector in Russia “only through structural divisions of foreign organizations created in Russia,” he said. The law on NGOs should outline additional requirements for agreements and programs of Russian NGOs with foreign funding, Chaika said. “They should state specific goals and events, territories of implementation and their participants,” Chaika said.